With 2 million inhabitants Amman is the capital and largest city of Jordan. Amman lies on a high plateau at about 800m above sea level, 30km to the east of the Jordan river valley. Until 1921, when Amman was chosen by Emir Abdullah to be the capital of the new Emirate of Transjordan, Amman was just a muddy farming village. Amman lacks the historic heritage and the s�ghts of the other capitals in the area, but is a very livable and pleasant city. Currently Amman is undergoing a dynamic development with lots of investment pouring in and new infrastructure being built. 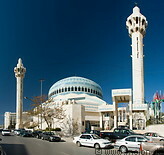 In Amman there are several modern malls and shopping complexes.